More than just carpets and cows! 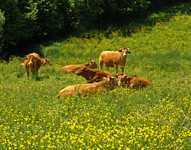 The Limousin region of Central France, in which the town of Aubusson is found, is famous for its distinctive Limousin cattle. However, Aubusson is best known for something quite different and rather more aesthetic, as it has been an acclaimed producer of wonderful carpets and tapestries since the Middle Ages. If you wish to buy one, this is the place to go. But even if your finances don't run to this, it is well worth a visit anyway to see these beautiful carpets, tapestries and rugs being made and restored. Aubusson itself is a fascinating town surrounded by the lush green countryside of central France. In Aubusson, the tapestry Museum, the 'Maison du Tapissier' is possibly the town's most famous attraction. It is not, however, the only place worth a visit as there is a great opportunity to see history in action at the 'Vieux Tapissier', which is a 15th Century weaver's house that is open to the public and at which it is possible to watch demonstrations of the craft. There is much of historical interest in the architecture itself, as the town retains a good deal of its Middle Ages past with some fascinating carved doorways and windows and some intriguing turrets to be found. There is also a charming old Church, 'Sainte Croix', a clock tower and 'Le Pont de le Terrade', an old bridge over the River Creuse. Aubusson is extremely conveniently placed for travel to and from the UK as it is not far from the International Airport of Limoges, which welcomes flights from London Stansted and Liverpool (Ryanair) and also from Southampton (flybe). For those who prefer the ferry, it takes around 6 hours to drive from Calais to Aubusson. What about Aubusson property prices and availability? The region of Limousin, known as the 'Green Heart of France', is truly one of the few remaining parts of France where property really is a bargain. It isn't as cheap as it was a few years ago, when few had discovered the delights of the region, but Aubusson is still a great place to seek your French dream home if you aren't on a millionaire's budget. Don't hang around too long though, as more and more people are buying in Aubusson and prices seem set to rise. Do you know Aubusson better than we do? Do you have photos of Aubusson? Aubusson is situated in the Creuse river valley, in central France. Slightly south east of the centre of the Creuse (23) department in the Limousin region. Access: By Air: Ryanair fly into Limoges airport from Stansted and Liverpool airports and Flybe fly to Limoges from Southampton. Road links from Calais are also good and driving from there takes around 6 hours. Economy: The town is famed worldwide for its beautiful rugs and tapestries. It is also a manufacturing town, with rubber, aluminium and electric lamps among the goods produced. Interesting fact: It was the purity of the water of the River Creuse that made Aubusson such a great centre for the weavers.